This Tiger started its life in the 3rd company of s.Pz.Abt.508. We are fortunate to have two colour photographs of it, and they show what appears to be a 3-colour scheme of red and green thick bands, with perhaps some Dunkelgelb base colour still showing between them. The tank is very dusty and the colour photographs are unreliable. 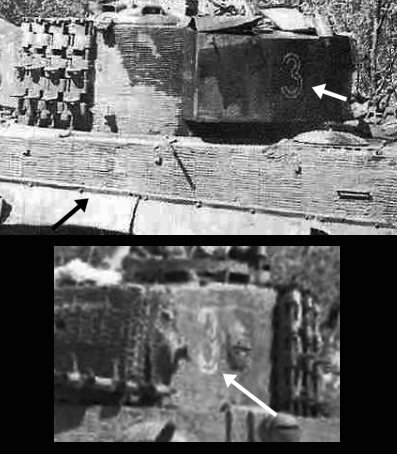 The photos clearly show that standard German crosses were applied to the hull sides. 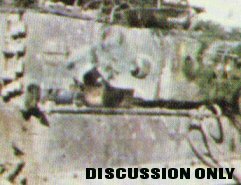 As for turret numbers, the Tigers of the 3rd company usually bore only a stencilled "3" digit, on each turret side and on the turret bin. This Tiger lost its turret bin and most of the Zimmerit on its turret walls. This probably happened before it was converted to a "Bergetiger". However, the turret left side retained its Zimmerit from the front corner back to the vision port. Therefore a "3" digit would presumably remain there, mostly obscured by dust. Any other colour schemes or markings provided in model kits, e.g. numbers such as "311" or "890", are fictional.